In today’s fast-evolving business environment automation and globalisation are essential, even for smaller companies. RMA provides companies with the necessary know-how in order to optimise their corporate processes and to adapt to this changing environment. Apart from revenue, managing the cost structure is fundamental when devising a successful strategy for the future. Only then can a company face the challenges that automation and globalisation pose for every business. Simplifying and optimising the internal administrative processes lets companies cut costs and release resources for tasks with more added value. Optimising production processes or reducing the defect rate and complaints make it possible to increase the operational margin. Thanks to our experience we can support companies in all these areas. Thanks to a combination of knowledge and experience we have become competent in the following fields. With our technical and communicative know-how we make sure you achieve results. We are experienced in identifying patterns and can quickly propose customized procedures. Our approach is modular and adaptable to the needs of a small- or medium-sized company. The end goal is to modify the corporate culture in such a way that the improvement process can continue once external support has ceased. The continuous improvement of quality constitutes one of the main elements in business management. It immediately increases the profit margin, production capacity and customer satisfaction. How much profit will your company make? Within every structure where rules apply, some type of control is needed to check whether those rules are being observed. The importance of control differs for every organisation and is mainly determined by the type of activities. Over time, without control, the observance of rules will leave much to be desired, and this –in turn– creates all types of risks. As your external partner we provide you with an objective analysis that enables you to calculate risks. Following our analysis, relying on our findings and experience, we make recommendations on how to safeguard processes and structures. The costs of bad quality can significantly impact the company’s results. This is particularly true when the problem only gets detected over time. Everyone is either familiar with the recalls issued by the major car manufacturers or has dealt with one within their own company. In addition, remakes also weigh on the available capacity. Even with a 0.6% defect rate, the cost –according to Mikel J. Harry– represents 15-20% of revenue. You can calculate yourself whether this applies to your company, but apart from a damaged reputation, the financial cost is certainly significant. Hence the great importance of a control system and of continuous improvement. We provide you with the know-how to implement a quality system very efficiently. This can be either a complete ISO 9001 system or a derived light version, attentive to your company’s specific needs. We do not depend on the certification body chosen by you and can assist you in selecting an external partner. In the initial stage, setting up a quality measuring system can produce objective information, upon which you can take further measures. Glass is breakable, that much we know. However, establishing the exact cause for a fracture requires very specific knowledge. In addition, glass products are becoming increasingly complex and so is detecting possible issues. Nevertheless, the cause often determines who will cover the damage. This is why the investigation should be left to independent experts. Thanks to our long-time and international experience we can make it possible for you to correctly determine the exact cause of the issue. Based on our findings we will draw up a report that you can then use both internally, for quality purposes, and externally, in legal proceedings. We are not tied to a glass producer nor to a processing company. This enables us to determine the cause in all objectivity. It may be appropriate to hire an interim manager who can bring in the experience that is lacking within the company, implement important changes within the company or lead very specific projects. You will be able to temporarily apply our vast management experience in process management, business organisation and export within your organization, and in a flexible manner. As your external partner we are less emotionally involved with the company and the staff. This makes it easier for an interim manager to implement certain changes. 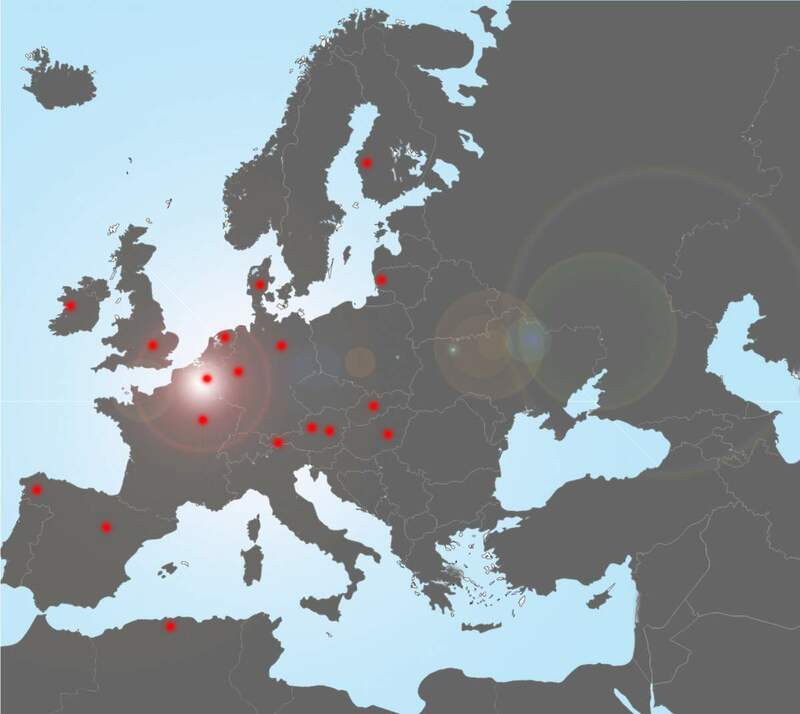 Our customers are located across Europe and North Africa. If the opportunity arises, we’ll also be willing to expand our activities in other countries. Production and processing of flat glass. This encompasses all processes of cutting, edge and surface processing, laminated glass, production of multiple glazing units and specialties such as heating glass, glass with built-in LED lighting, built-in screens. Facade treatment and restoration techniques, concrete repair and waterproofing, pest control, window production and installation. We have worked with the following companies, either directly or as a subcontractor. This button will load a TeamViewer file, enabling us to connect with your computer. This enables you now to participate in our yearly photo competition. Step 1: Make a photo of yourself together with the ball and the RMA-logo clearly visible. Step 2: Mail your photo and describe in your mail as good as possible the location where you found the ball. At the end of each year, we give away some interesting prices to selected participants. Originality is an important factor during the selection of the winners. We hope our RMA-logo ball will bring you joy and luck during the golfgame.